Language Bar: Use the Language Bar to switch between the language keyboards in Windows. There are a few options you can play with for how to use the Language Bar. 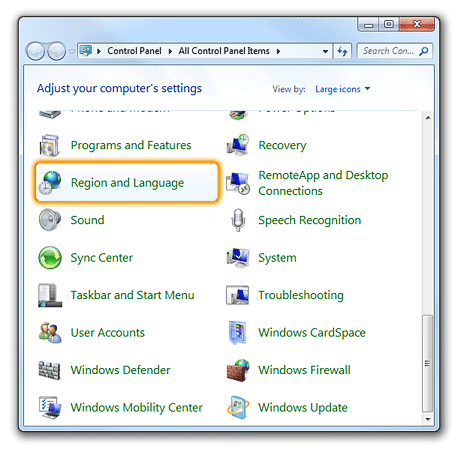 To view options go to Start Menu > Control Panel > Region and Language. Click on Change keyboards... and select the Language Bar tab. The left Alt key + Shift will cycle through the activated language keyboards. On-Screen Keyboard: Using the On-Screen Keyboard is not required, but may be helpful for test takers typing in a character-based language. Test takers can click the keys on the On-Screen Keyboard, or use it as a keyboard layout reference when typing on the physical keyboard. To turn on the On-Screen Keyboard click on the Start menu and type "OSK" in the "Search programs and files" field.. IMPORTANT: To setup an On-Screen Keyboard for test takers, go into the options and uncheck "Use Text Prediction" as shown in the images below to ensure the On-Screen Keyboard is not aiding test takers with their writing. Once the On-Screen Keyboard is turned on, switching a language in the Language Bar will make it show up on the On-Screen Keyboard.